Winter has set in, or I’m just really feeling the cold this year. It’s officially casserole season in our house and curries are always a favourite. 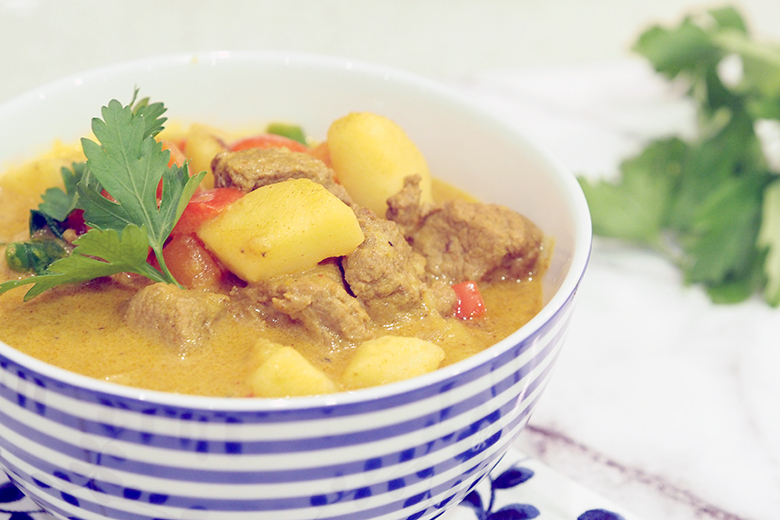 This Beef Curry takes only 30 minutes to cook, full of flavour and deliciously tender vegetables. 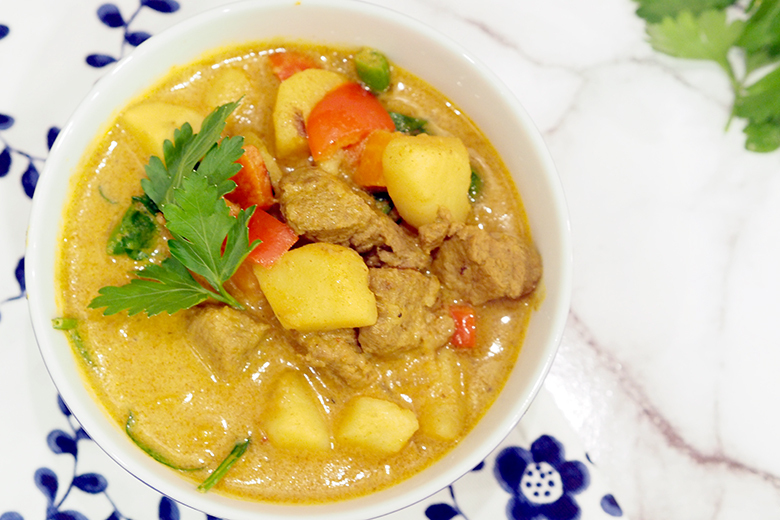 I’ve made this curry several times, in the recipe I list to use Korma curry paste, however, you can use whichever curry paste tickles your fancy or suits your taste buds. 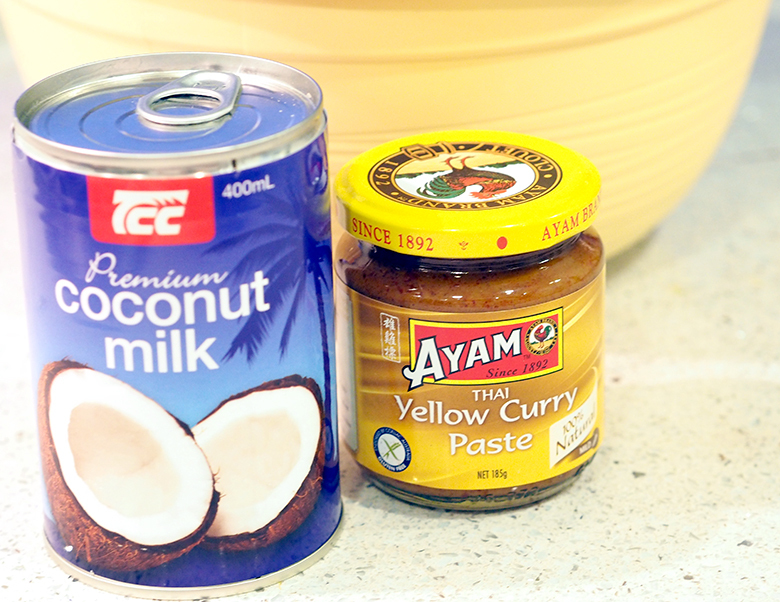 I recently used yellow curry paste as the supermarket didn’t have korma available, it was just as good, perhaps better? Hubby and the kids came home as I was cooking this curry and they said they could smell it from the letter box, and smelt even better when they got inside. Add 1 tablespoon oil to a large hot saucepan. Brown half of the beef. Remove from pan, add little more oil, brown remaining beef. Remove beef from pan, add the remaining oil and cook onion for 1 min. Add curry, stirring for 30 seconds. Add potatoes, slowly stirring for 2 minutes. Add coconut milk and stock. Bring to the boil. Reduce heat to medium, add beef. Cover and cook for 10-15 min until potatoes are soft. Add beans and capsicum, cook for 2 minutes. Add spinach, cook for 1 minute, serve. Note: this post has been updated with new photos, it was originally posted on 9th January 2012. This recipe looks great, thank you for sharing. Can I just check on which cut of beef you used please? I am seeing a lot of programming data. sounds delicious…what beef was it please? Can this be cooked in the slow cooker? Would I have to do anything different? 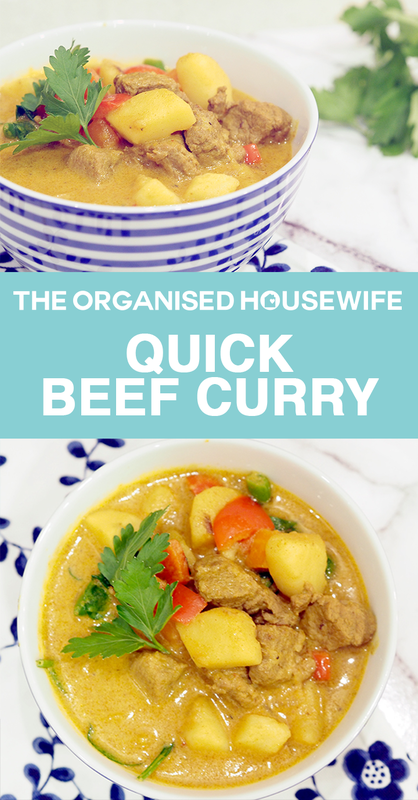 I LOVE curry’s but my husband doesn’t so I’ve never made them but I’d like my boys to try for themselves. Is this pretty mild? Sorry for so many questions. : ) Thanks! I made this recipe for my family and it was a huge hit!!! This will be a regular on my weekly meal planner. Wonderful, so pleased they enjoyed it!! What type of beef so you use ? Pen, I just use the beef already diced at the supermarket.